Space archaeology: Bill to create a national park on the moon. Apollo 11 astronaut Buzz Aldrin stands beside a recently deployed lunar seismometer, looking back toward the lunar landing module, in 1969. Do we really want other people to be walking all over this area? Beth O’Leary is an archaeologist at New Mexico State University. She has created a project with NASA to make the 1969 Apollo 11 lunar landing site a National Historic Landmark. Now there is a bill in Congress that proposes to protect the Apollo lunar landing site. Jon White: As longtime champion of a national park on the moon, what do you think of the bill in the U.S. Congress that proposes to create one? Beth O’Leary: I wasn’t involved in writing the bill, but I applaud those who put it forward. 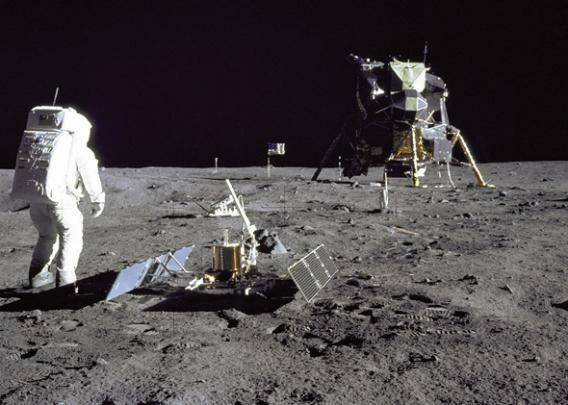 It is a first attempt to secure legal protection for the Apollo moon landing artifacts. Will it succeed? Probably not. But if it opens the discussion, that’s good. JW: Why do such remote sites need protecting? BO: There are plans to return to the moon. There’s the Google Lunar X Prize, which is a competition for a robotic mission, and eventually people are going to go back too. We have lost a lot of things on Earth by not having the protocols in place. In my deepest fears, the moon becomes a marketplace. You only have to look at sites selling space memorabilia. Some of these things are very, very valuable. JW: Is a U.S. national park the best solution? BO: When we say the United States will make a park, people in the international community may perceive that as a claim of sovereignty. We have been very careful to talk about just the artifacts. The trick is the legality of doing this. That’s what I have struggled with for the last 14 years. I am a believer that when those first people went to the moon, they didn’t just represent America but humanity as a whole. Ultimately, the attempt to preserve sites has to be international. JW: Are there any precedents? BO: Antarctica, which we have protected by a series of treaties with different countries. The other analogy is admiralty law, which covers the oceans. JW: Does other space material need protection? BO: Vanguard 1 is a good example: It’s the oldest artificial satellite still in orbit, and NASA predicts it will be there for another 600 years. Hubble is due to be retired. Is there a way to preserve these in space, put them at a Lagrangian point—where they can maintain a stable orbit—and leave them for future space tourism? Colleagues of mine were distressed when Russia’s Mir space station came down in 2001. Could it have been saved? JW: Apart from advocating preservation, what do you do as a space archaeologist? BO: We look at material culture left in outer space or on other celestial bodies. It is quite a recent group of artifacts and sites, but you can do archaeology in all places. This place happens to be off Earth. JW: How can you work at such distances? BO: A lot of archaeology is now done by remote sensing, using aerial or satellite photos. The Lunar Reconnaissance Orbiter, which maps the moon, came close enough to image the Apollo 11 lander and traces of the astronauts’ presence. These are comparable to the kind of pictures we would take of the remains of ancient roads in the Chaco Canyon in New Mexico, for example. JW: How did you get interested in this field? BO: As a girl I wanted to be an astronaut. But I chose another A-word, archaeology. In 1999 a student asked whether federal preservation law applies on the moon. You know, when you get a good question like that, you just have to go with it.